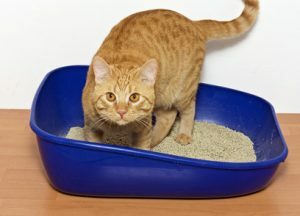 If your cat has stopped using the litter box, these quick fixes should help. But remember, old habits can be hard to break. Be patient. And don’t yell at or punish your cat. Creating perfect litter box habits again could take time, patience and, maybe most important, compromise. – If your cat has stopped using the litter box and is using the floor just outside his box instead, it’s possible that all he needs is a larger box with more room to move around. Put the new box beside the old one. Many cats like having two boxes side by side. –Try Cat Attract litter. This works for some cats but not all. – Give him an empty box with no litter in it at all. Although it sounds counter-intuitive, many cats who have stopped using a litter box will use an empty box with no litter in it at all. Putting a puppy pad in the box will make cleanup easier for you. – Sprinkle catnip in places where he’s eliminating inappropriately. Catnip is a “friendly” scent and discourages urine marking. Feliway mimics the friendly pheromones in a cat’s cheeks and also discourages inappropriate elimination. – If your cat has stopped using the litter box and is eliminating on furniture or in many locations around your house, try putting a litter box in every location he uses, even if it’s the sofa or a bed. Sprinkle catnip around the box, so he’ll use it instead of the furniture. Empty litter or storage boxes with very low sides will work best. The storage boxes designed to slide under beds make great litter boxes! When he’s using some of the boxes consistently, you can gradually remove the others and try moving the ones he’s using, inch by inch, to locations that are acceptable to both of you. As you move the boxes, make sure you’re moving them towards places where the cat will feel secure and safe. — Some cats won’t use a litter box, no matter what you do. As a last resort, put piles of puppy training pads on the floor everyplace where he eliminates inappropriately. If you put two or three pads on top of each other, the cat will be able to dig and bury his waste without damaging your floor or furniture. – If your cat has stopped using the litter box and likes to be outside, consider making him an outdoor cat. He’ll probably enjoy that lifestyle, and it’s a happier solution than rehoming him or taking him to a shelter.